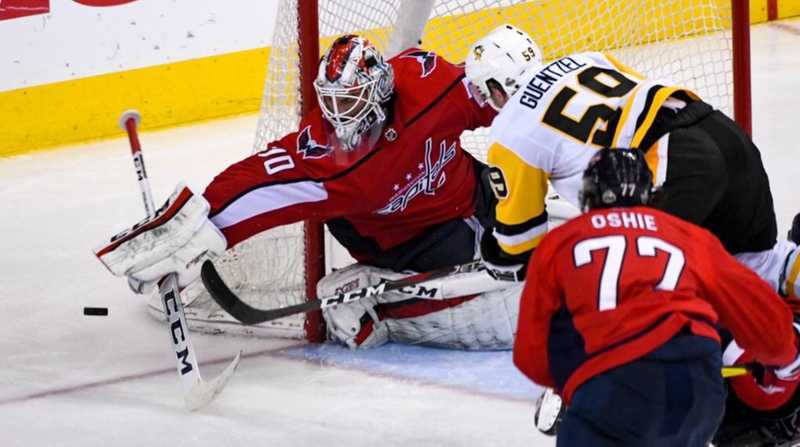 The Capitals beat the Penguins were it counts, on the scoreboard, 2-1, Wednesday night at Capital One Arena. But most of the offensive numbers don’t tell the same story. In fact, they were rather ugly. But games like this will happen. The important thing is “Just win, Baby”. Braden Holtby would be the difference. The latest edition of Pens-Caps featured two teams still trying to get “it” going this season, as both teams were just a game over .500 at 6-4-3 entering tonight’s contest. The Penguins limped into the District, losers of their last three games. The Capitals, yet to win two games in a row, so far this season. The Penguins would open the scoring in this one, with a power play goal from Sidney Crosby, making it 1-0 at the first intermission. Alex Ovechkin would tie the game with a power play goal midway through the second frame for a 1-1 tie at the second intermission. T.J. Oshie would score the game-winner with 1:14 left in regulation. The Capitals were 20th in the league in shots on goal per game coming into the tilt with the Penguins, with a 30.5 average. The Penguins were 14th in the league with a 32.1 shots/game average. The Capitals were 12th in the league in shots on goal against at 32.5, while the Penguins were the 5th worst in the league at 34.1 shots on goal against per game. 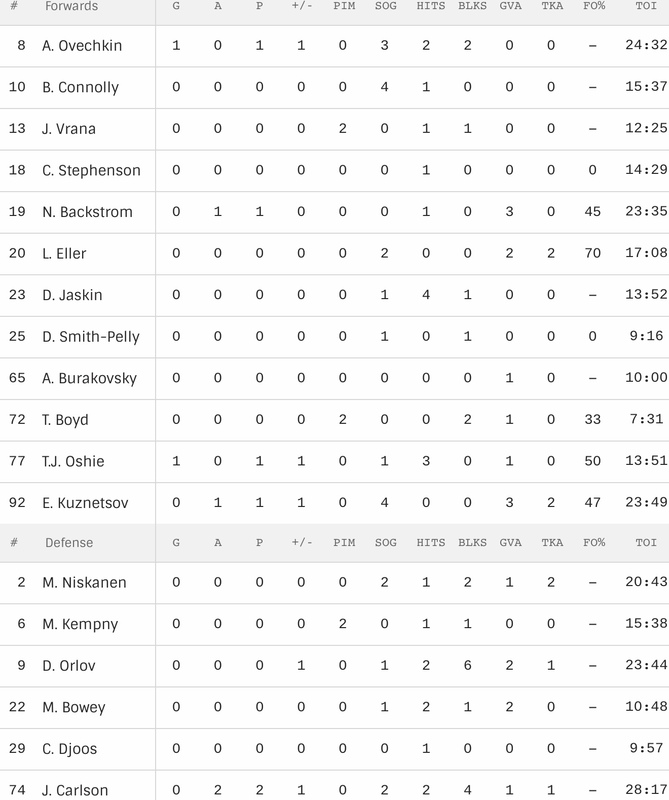 The Pens dominated the first period in shot attempts, 18-9, led in shots on goal, 9-7, and led 1-0 on the scoreboard. The Pens out-attempted the Caps 22-14 and led 17-10 in shots on goal for the second period. The Pens dominated shot attempts in the final frame 29-6 and led 16-5 in shots on goal. In the end, the Capitals were out-attempted in shots 70-29 and 42-22 in shots on goal. 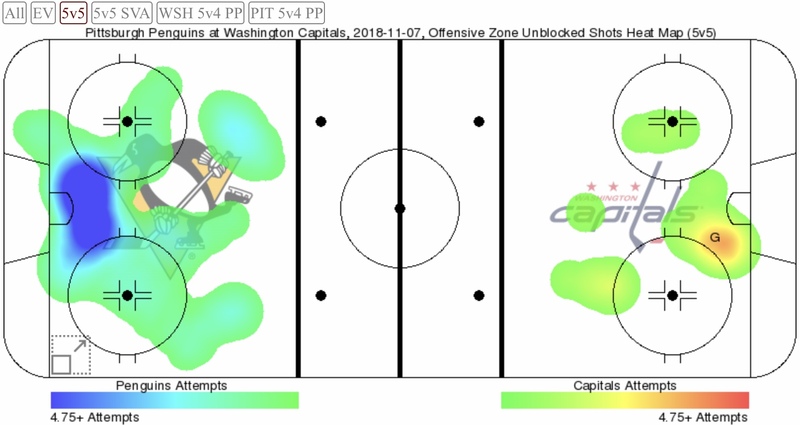 The game’s heat map for shot attempt locations shows the Capitals getting beat by a final score of 10-1. The map shows extensive net-front shot production for the Pens. But luckily for the Capitals, the games aren’t decided by heat maps (thank goodness). Braden Holtby had a fantastic game, stopping 41 of 42 shots faced, for a .976 save percentage. Casey DeSmith stopped 20 of 22 shots for a .909 save percentage. The Capitals entered the game with the league’s best power play at 36.6% and the 25th ranked penalty kill at 75.0%. The Penguins had the league’s 12th best power play at 23.1% and the league’s 11th best penalty kill at 81.6%. The Capitals were 1 for 6 and the Penguins 1 for 3 on the power play. Coming into the game, the Penguins had the league’s 6th best faceoff winning percentage at 51.7%. The Capitals had the league’s 25th best winning percentage at 48.1%. The numbers would hold true for the game, as the Penguins would win the battle at the faceoff circle 52-48%. Chandler Stephenson was 0 for 1, Nicklas Backstrom was 10 for 22 (45%), Lars Eller was 7 for 10 (70%), Devante Smith-Pelly was 0 for 2, Travis Boyd was 1 for 3 (33%), T.J. Oshie was 1 for 2 (50%) and Evgeny Kuznetsov was 9 for 19 (47%). Nothing too surprising here. Brett Connolly continues to shoot the puck. He and Evgeny Kuznetsov led the Caps with 4 shots on goal for the game. Reirden throttled-Back the minutes for Madison Bowey and Christian Djoos in this contest. Both averaged around 15 minutes of ice time last game but only 10 minutes against the Penguins. Andre Burakovsky’s minutes continue to be slight. This entry was posted in News and tagged Alex Ovechkin, Braden Holtby, Inside The Numbers, Jon Sorensen, Pittsburgh Penguins, T.J. Oshie, Washington Capitals. Bookmark the permalink.